WEST ORANGE, NJ--(Marketwired - Oct 15, 2014) - Robotics researchers at Kessler Foundation are broadening their investigation of the application of exoskeletal devices for rehabilitation and community use. Kessler Foundation is one of five leading rehabilitation research centers within the United States to receive Indego -- a powered lower limb orthosis, also known as an exoskeleton -- as part of a new national multicenter study. From Parker Hannifin, Indego offers people with impaired mobility a new level of independence by enabling them to stand and walk. Researchers will use Indego in a study of over-ground, task-specific gait training in adults with weakness or paralysis caused by complete and incomplete spinal cord injury. "We are pleased to be designated as a study site for Indego research," said Gail Forrest, PT, PhD, principal investigator and director of Human Performance & Engineering Research at Kessler Foundation. 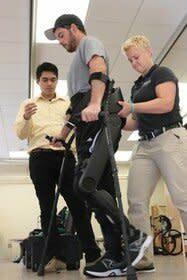 "Working with fellow scientists will enhance our knowledge of the impact of exoskeletal-assisted walking. With Indego, we will be able to examine participants' performance when they encounter indoor and outdoor surfaces, elevators, and doorways," she added, "and how they manage walking for extended distances and seating of different heights. These are essential skills for optimal use in rehabilitation and the community." A selected team of scientists and therapists at Kessler has been trained by experienced Indego trainers from Shepherd Center in Atlanta, GA, which serves as Parker's lead rehabilitation center for clinical testing of the device. "We are very excited to have Kessler Foundation as one of our clinical partners," said Achilleas Dorotheou, head of the human motion and control business unit for Parker. "Our objective is to bring Indego to market to offer clinicians an effective rehabilitation tool and to enable people who were told they would never walk again, to stand upright and walk and provide a new level of independence. We will be working with the best and most respected rehabilitation clinicians and researchers in the country, gathering evidence that not only demonstrates the safety of Indego but proves its tangible clinical and economic benefit." "Wider availability and broader application of these devices is likely to change the face of physical rehabilitation," noted Rodger DeRose, president and CEO of Kessler Foundation. "In addition to looking at safety and efficacy, we need research that explores how the incorporation of exoskeletons into rehabilitation protocols may improve outcomes for people paralyzed by stroke, brain injury, and other disorders, as well as spinal cord injury. Because of close relationship with Kessler Institute for Rehabilitation, we are uniquely positioned to conduct these types of clinical studies." Indego is available in the United States only for investigational use until FDA approval has been obtained, which is anticipated for mid 2015. The other centers that have been selected to participate in the Indego trial are the Rehabilitation Institute of Chicago, Craig Hospital, NYU Rusk Institute for Rehabilitation and Shepherd Center. Robotics research is a collaborative effort of Human Performance & Engineering Research (director, Guang Yue, PhD; Gail Forrest, PT, PhD, assistant director), Spinal Cord Injury Research (director, Trevor Dyson-Hudson, MD; co-director Steven Kirshblum, MD), the Neuroimaging Center (director, John DeLuca, PhD), and Stroke Rehabilitation Research (director, A.M. Barrett, MD). Collaborators include Kessler Institute for Rehabilitation, the James J. Peters VA Medical Center, NJIT and Children's Specialized Hospital. Scientists study the application of exoskeletal devices and the Lokomat v6 robotic treadmill device in individuals with paralysis and weakness caused by spinal cord injury, stroke and brain injury. Studies extend beyond measures of gait and walking ability to include the impact of exoskeletal-assisted standing and walking on secondary complications such as chronic pain, impaired bowel and bladder function, cardiovascular risks, and pressure ulcers. Funders include the Department of Defense, NJ Commission on SCI Research, Craig H. Neilsen Foundation, National Institute on Disability & Rehabilitation Research, Veterans Administration, and Kessler Foundation. Kessler clinicians and scientists have faculty appointments at Rutgers-New Jersey Medical School. With annual sales of $13 billion in fiscal year 2014, Parker Hannifin is the world's leading diversified manufacturer of motion and control technologies and systems, providing precision-engineered solutions for a wide variety of mobile, industrial and aerospace markets. The company employs approximately 57,500 people in 50 countries around the world. Parker has increased its annual dividends paid to shareholders for 58 consecutive fiscal years, among the top five longest-running dividend-increase records in the S&P 500 index. For more information, visit the company's website at www.parker.com, or its investor information website at www.phstock.com.